My natural sleep position looks like I’m doing an army crawl, or climbing a rock wall. Sprawled out on my stomach, with one leg up, the other leg down, hips twisted, and neck twisted. I’ve tried for years to break that habit, in vain. I have no problem starting out on my back: I lay down, close my eyes, and I’m asleep in 30 seconds. But sometime in the middle of the night I roll over in my sleep, and I wake up all twisted with a sore back. I know this is bad for my back. I’ve had many chiropractors and doctors tell me so. There are many good articles explaining why sleeping on your back is best. However, when I looked for advice on learning how to be a stomach sleeper, I couldn’t find anything great. The best I could find was asking Chrissy to nudge me (which depends on her being awake to notice), sewing tennis balls to my pajamas (to make me uncomfortable when I roll onto my stomach), or propping myself up with a variety of pillows (didn’t work for me). I thought to myself, I just need some straps or a giant clamp to keep me locked in position. Like an astronaut strapped in on the space station. So that’s what I made! 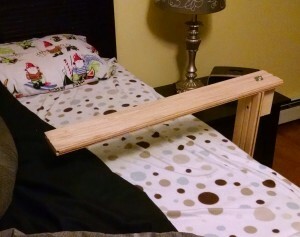 The top piece swivels out so that I can get into bed. After I’m in place on my back, I swivel it onto my hips and I’m locked in. I’ve been using this for a couple of months and I haven’t rolled onto my stomach once. At first I would wake up a few times a night and fight it, and then semi-consciously realize what was going on and go back to sleep. Now I rarely wake up at all. Maybe one day soon I’ll be well enough trained to ditch the clamp. I made these simple floating shelves for our new basement room. The kids put their assembled Lego creations on the shelves, and keep their sorted parts in the organizers below. 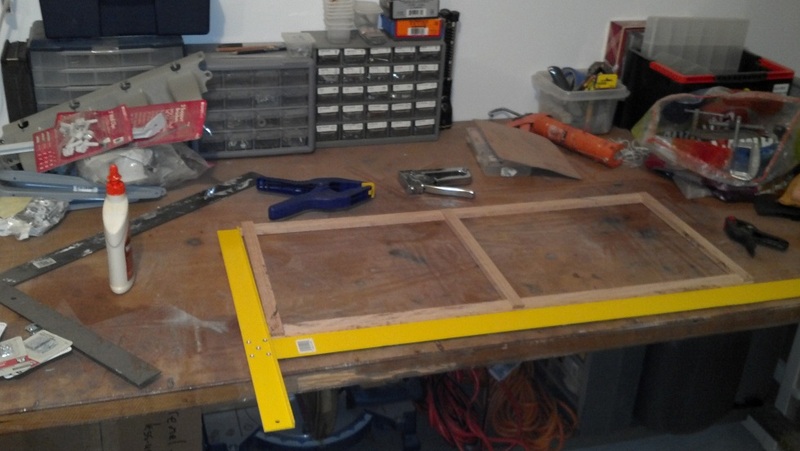 I started by assembling 3 “ladders” from 2×3’s, and screwing them into the concrete block wall – 3 screws in each. 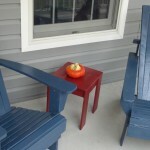 Then I tacked on plywood tops and sides, sanded, and painted. They turned out to be very sturdy. 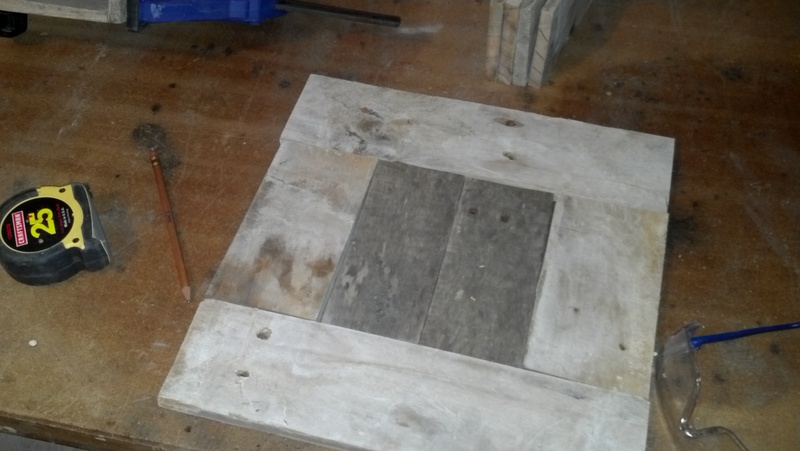 Second to pallet boards, 2×3’s are quickly becoming my favorite go-to material for DIY projects. (You can also spot them in my utility shelves through the doorway in the last shot.) They’re the cheapest studs at Home Depot. Even after digging past the really-warped ones, they’re never totally straight, but that’s not a problem for a project like this. I straightened the long ones out on the wall when I screwed them in, and the “rungs” of the ladder are short enough to hide any warping. 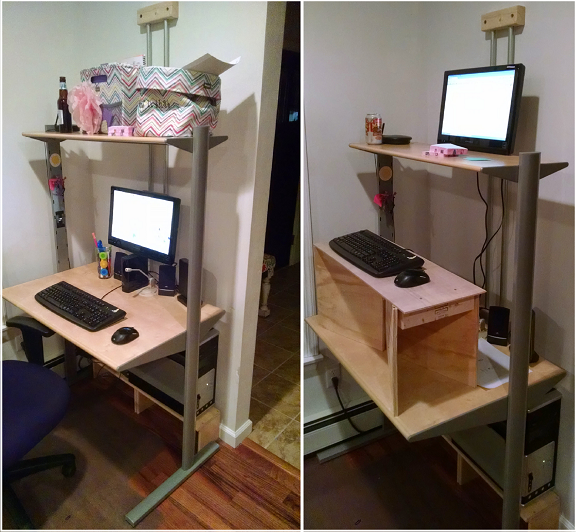 I built a simple standing desk last weekend. Since the rest of the family also uses the PC and prefers to sit, I had to make it easy to switch between standing and sitting modes. A wall-mounted sliding monitor holder. 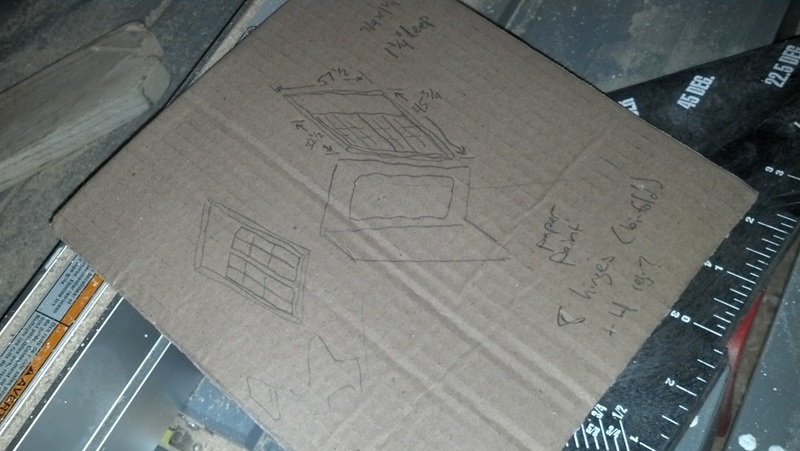 A collapsible plywood keyboard & mouse shelf. Total cost (not including some scrap wood and a few screws) was $3.50, and it only took an hour or so to build. 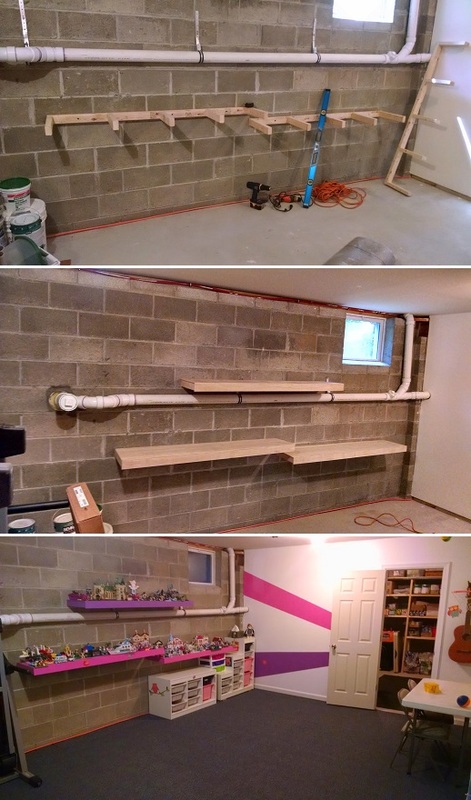 For the wall rails, I bought a 10-foot length of 1/2″ conduit. I drilled some deep holes into scrap 2×3’s to sink the conduit into, and secured the blocks to the drywall with wall anchors. The bracket for the back of the monitor uses 3/4″ set-screw couplings (found right next to the conduit in Home Depot). I replaced the set-screws with longer machine screws, so that I could put them through the scrap of mdf board that I screwed into the back of the monitor. When the monitor is down in sitting position, I rest it on top of an external hard drive. It takes about a minute to convert to standing position. First I move Chrissy’s baskets and slide the monitor up, resting it on the top shelf of the desk. Then I assemble the mouse/keyboard shelf and I’m ready to work. The keyboard stand is 3 pieces of interlocking plywood. The two bottom pieces are notched in the middle, so that I can fit them together in an “X” shape. 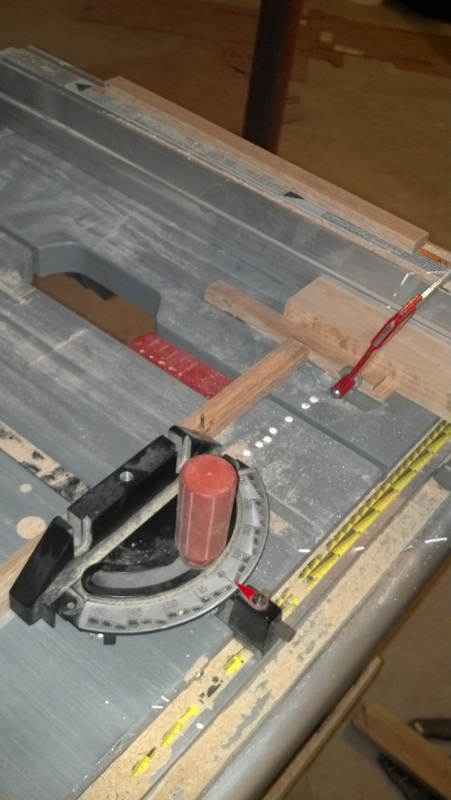 The top piece has a few scraps of wood nailed to its underside, to lock in place around the X. You can see a much more elegant take on the same idea in the StandStand. When taken apart, it leans inconspicuously beside a cabinet on the other side of the room. 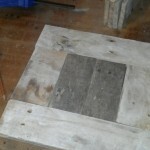 A set of coasters that I made last fall, from scraps of pulled-apart pallet wood. Paint the sides in a contrasting color, so that the target (the top of the coaster) is clearly distinguishable when you’re putting your drink down. 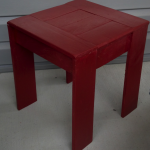 Even before I finished building my chair, I started thinking about building this side table. I struggled to find a design that I liked. It needed to be fairly short, and I wanted to match the simplicity of our Adirondack chairs. 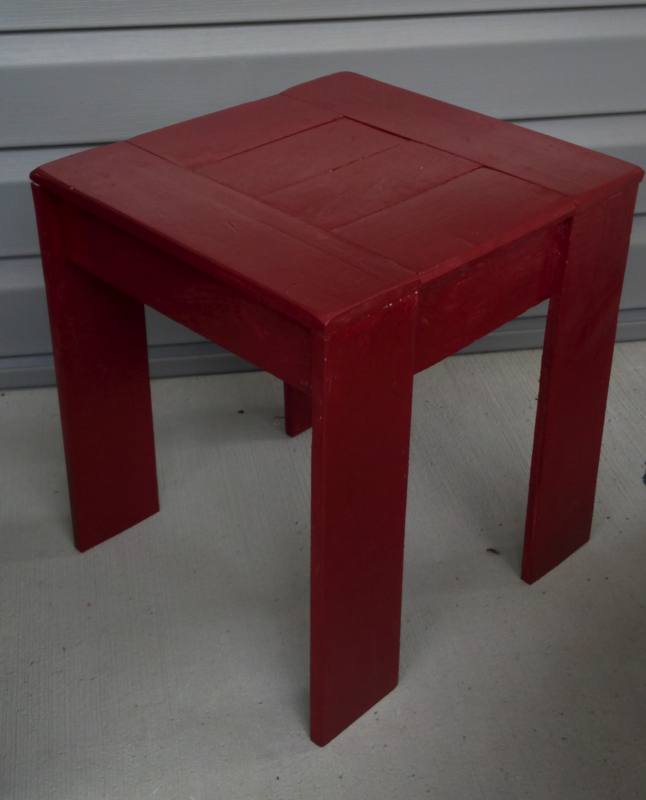 Most of the tables I found had tall, tapered legs, or elaborate tops & shelves. 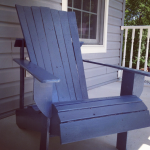 I finally found inspiration in this DIY modern outdoor patio collection. The key is in the way that the outer boards on the tabletop line up with the legs, making the plain, wide legs look deliberate. 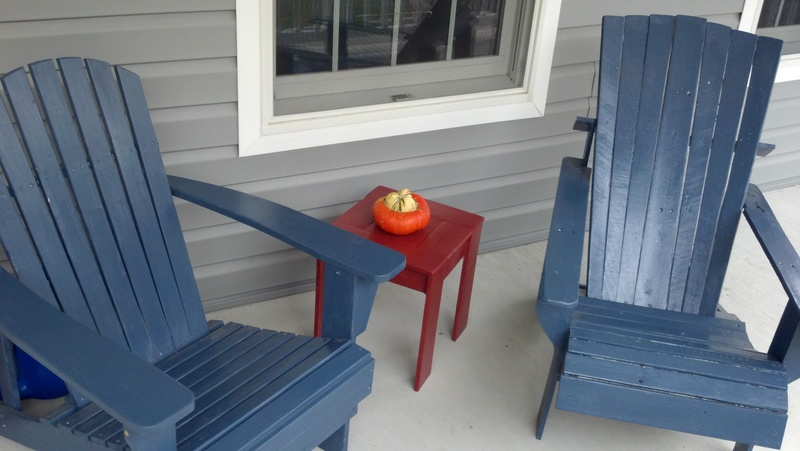 I finished it the same way I did the chairs & flowerboxes: one coat of primer, one coat of paint, one coat of polyurethane. 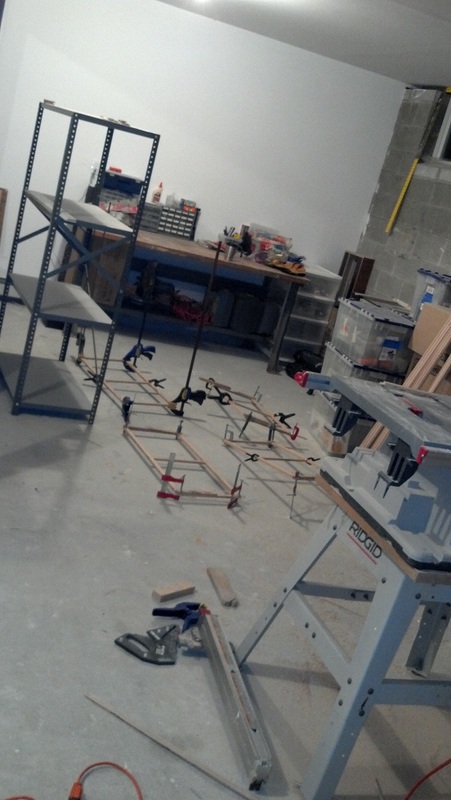 I love woodworking, but I don’t spend a lot of money on my hobbies. Pallet wood saves me from buying lumber at Home Depot, or even worse, forking over the money to buy good hardwood boards. 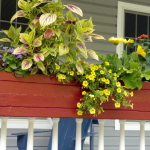 Pallets appeal to me in other ways, too: I like knowing that I’m saving a little bit of waste from a landfill, and I like the perspective that I gain from having to sand, straighten, and clean up the rough wood. I’ve also found that it’s satisfying to make-do with irregular sized boards. 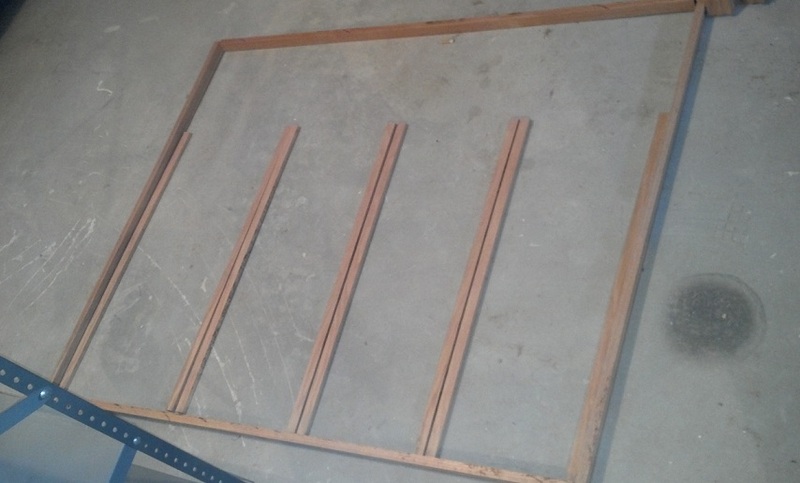 Rather than just buying the correct amount of stock-sized lumber off the shelf, I force myself to work with the boards I have, and make adjustments to my plans. That really makes me think through my design carefully, and be more creative in improvising on it. My first and biggest challenge was figuring out how to take pallets apart. 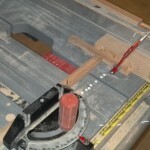 They’re held together with spiral-shank nails, making the boards nearly impossible to pry loose. 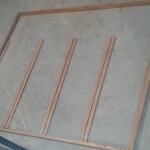 I started out by trying brute force, but that was frustrating because I wound up splitting so many of the boards. After scouring the internet for tips & doing a bit of experimenting, I’ve settled on a quick & reliable technique. I drill a small hole next to each nail, which relieves the pressure and makes it fairly easy to pry the boards loose with a flatbar & hammer. 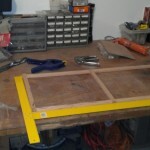 I’m busy at work on a couple of current projects with pallets and with other scrap boards. 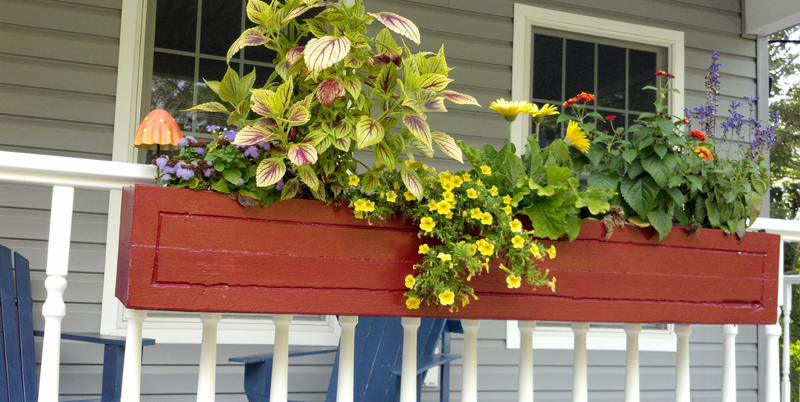 I’ll share these, with more detailed instructions & tips, in a few upcoming posts. If you find them useful, or have tips of your own, I would love to hear from you in the comments. 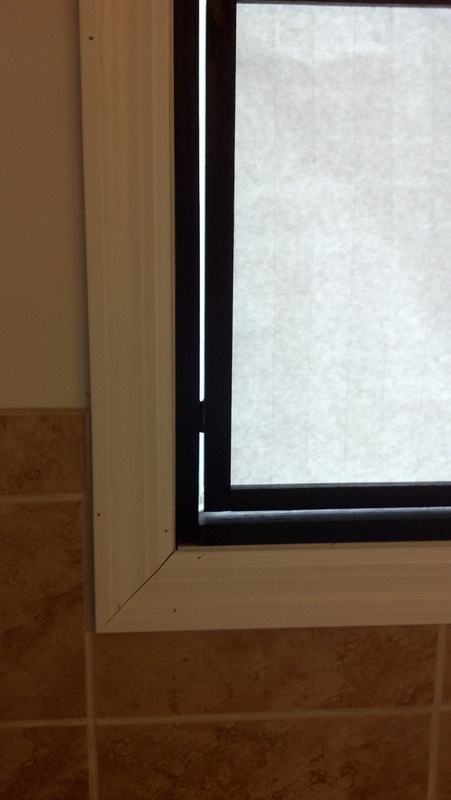 It’s an odd-size window, and large. 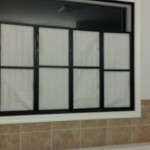 Custom-order blinds aren’t cheap. 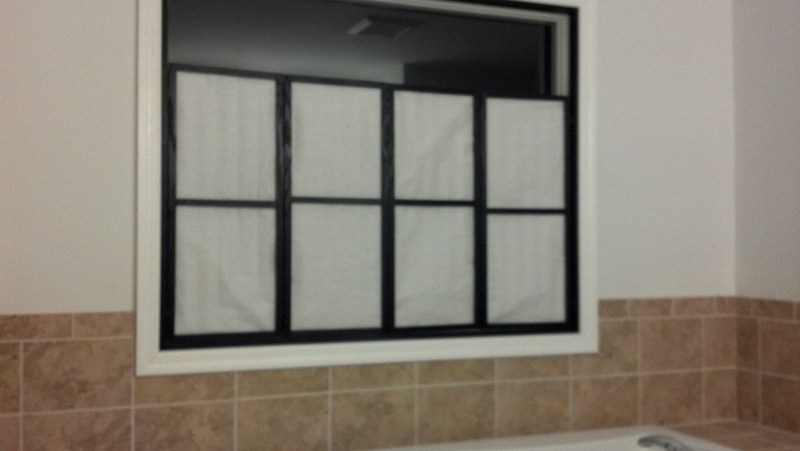 We didn’t want to cover up the whole window, but we did need privacy since it’s a bathroom. 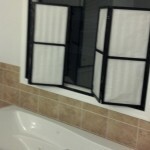 Bottom-up blinds would work, but Chrissy & I weren’t sure we’d like that look. 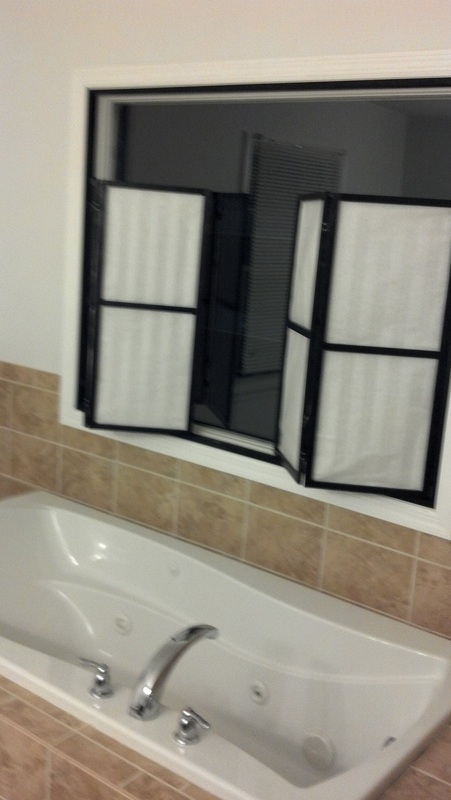 While searching the web for alternative ideas, I saw someone who had used wooden shutters to cover the bottom 3/4 of their kitchen sink window. 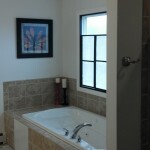 It provided privacy, while still letting them look out the window and letting light shine in. 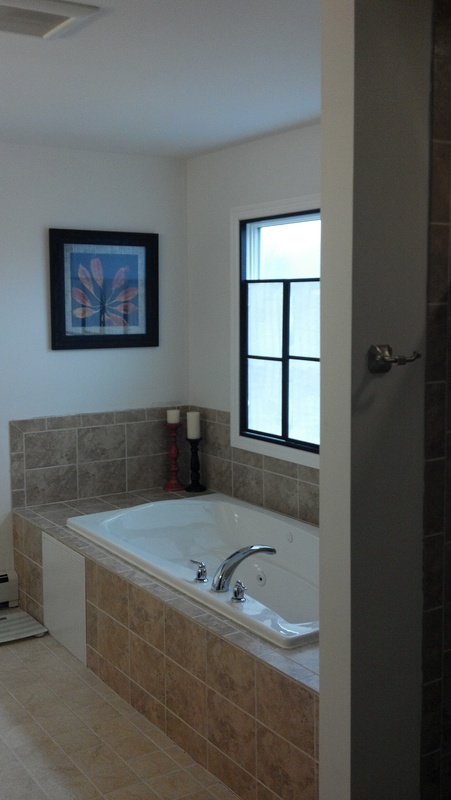 I liked that idea, but shutters would be too folksy for our bathroom style. 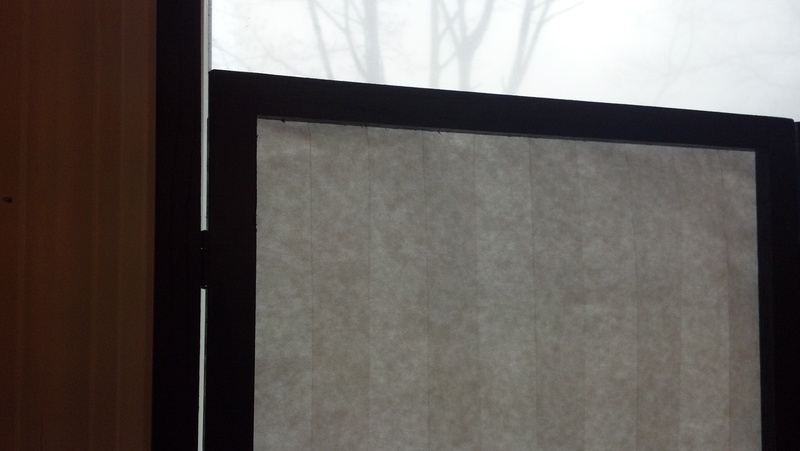 Another neat idea I came across was shoji paper blinds, which would let light through and look more elegant. 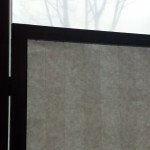 The 3rd piece of inspiration was this article about DIY bottom-up blinds, from which I got the idea of using cheap temporary shades to keep the cost down. 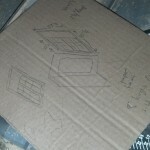 Combine that with the leftover oak boards from our stair landing, and an idea started to form for a fun project. 1 temporary shade — bought for $4 at Home Depot, and cut into sections, which I stapled to the back of the shade frame. 8 small hinges — I found these in a hobby section at HD. They didn’t have the size I wanted in black, so I bought some unfinished ones and a can of matte-finish black spraypaint. I did all the joints as half-lap, something I’d never tried before. Other than taking a long time to cut all the slots with a plain table saw blade , this was pretty easy and I was happy with the result. Since the backside is covered with paper, I could get away with a little bit of a sloppy fit, so it was a good project to practice this skill on. 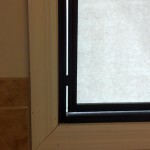 I nailed a frame around the outside of the window, so that I would have something consistent to screw into and to border the top of the window. I posted about my workout logger page a few months back. 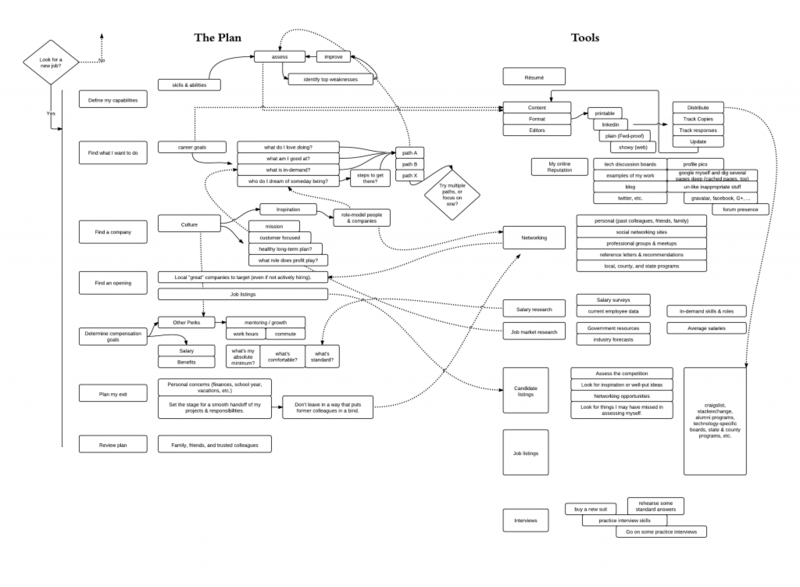 I’ve been using it steadily since then, but with the house project I had no time to work on improving the page. Recently I’ve gone back to it and added a few tiny bits of functionality, like straight-to-wordpress blogging of my workouts, and persistent storage so that I won’t lose my workout details if I accidentally navigate away from the page. I’ve also been tweaking the UI gradually, to make it a smoother experience on my phone’s browser: bigger buttons so I don’t have to concentrate so hard on pressing the right thing, dynamically hiding controls when they aren’t needed, etc. It’s been fun doing a some coding with purpose again, and it’s also helped me focus my workouts better. Try it out at the pictured url if you want. Next I think I might add a real backend, to do more interesting things with the collected data. Three months ago I left my job of 14 years, where I’d worked on the same product with many of the same people since I started part-time in college. There were a lot of things that I had loved about that job, and a lot of things that I still thought were great, but I had this growing sense that it was time to move on. The only problem was, I had no idea how to do that. Of course I was aware of some of the basics — I hadn’t been living in a vacuum — but I didn’t know firsthand where to start and how to proceed. I set out analyzing my feelings, figuring out what my options were, and creating a plan for how to go forward. I rarely use pen & paper anymore, but this was one of those tough brain-dumping exercises where I needed to blurt ideas out freely on a pad, then spend time later exploring them and fleshing them out. After lots of days & hours working through the ideas, tossing some out and adding new ones in, and talking them out with Chrissy and others, I settled on a plan that I could believe in. Click the image below to see the chart full-size, or download it as a pdf file. If you’ve read this far, maybe you’re in a similar spot. I know it’s a very scary place to be, but it’s also exciting to have such an opportunity to steer your future. I hope my chart can help you in some small way, and I wish you the best of luck! 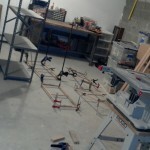 Last weekend I set out to build a shelf for G’s room. My main goals were to custom-fit it to a particular wall in her room, and to keep the cost low. I’d done a few shelves like this in our last house, using melamine boards from Home Depot or Lowe’s. After sketching my rough plans, my usual next step is to drive over to Home Depot and look at what boards they have in stock. I then adjust my plans on the fly while standing in the store aisles. This time I decided to try doing that step at home, via the web. That way I could know the exact cost ahead of time, compare other stores’ prices, look at alternative materials, and decide whether to buy vs. build. 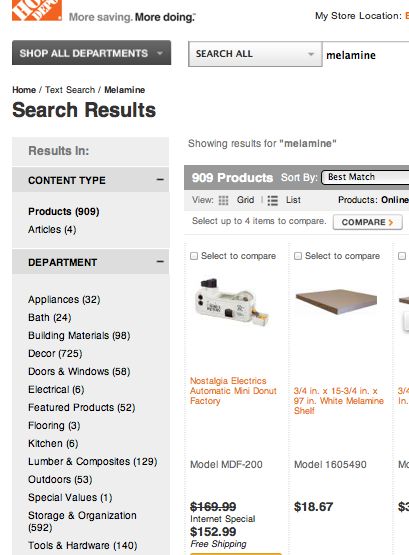 I persevered and clicked through several pages of results on the Home Depot site, eventually finding the few different boards that I had in mind. The exercise made me think, though, that there is potential for a retailer that can provide a great user experience and great results for this kind of situation.